Ship-shape and Banksy Fashion | O'Really? To my mind the worlds of graffiti and blogging have much in common. As art forms, they both have a low barrier to entry – all you need is a can of spray paint – or an internet connection. Both blogging and graffiti are often frowned on by The Establishment™. Some of this is probably due to the highly variable quality of blogs and “street art” but when they are done well, they are both worth paying attention too. Last but not least, the Web is like a big public wall where pretty much anyone can scribble, spray and scrawl anything they like, which can be powerful stuff. As one graffiti artist once put it – the can is mightier than the sword – and the Web is mightier than the sword too. 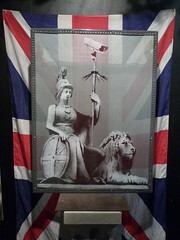 The mighty exhibition Banksy vs. The Museum has been incredibly popular and a huge success, with large queues every day especially at weekends. So if you’re interested in going, get there ship-shape, Bristol fashion and early before it opens at 10am each day and finishes on 31st August 2009.